The calculation is explained with an example below. Company base currency is AED. 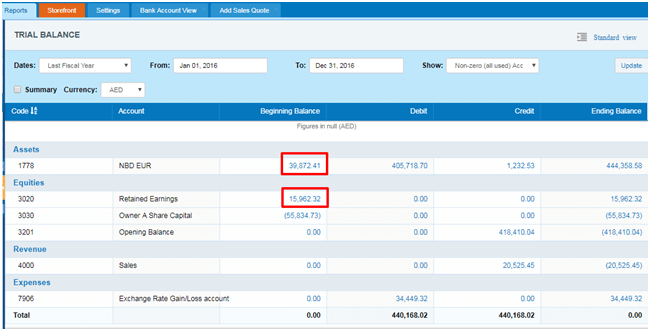 Trial balance report is generated for Jan 1, 2016 to Dec 31, 2016. Then, system will calculate gain or loss subtracting Base Amount from Converted amount: 374,311.93 – 374,586.85 = 274.92. This amount (274.92) will be shown as loss in Exchange Rate Gain/Loss account. And, if Accounts Receivable – USD account has balance for the previous period (Dec 31, 2015). This amount will be converted to base currency with rate at the end date of previous reporting period. It will be Dec 31, 2015 in our case. And if converted amount is different from the amount in base currency, gain or loss will be recorded to Retained Earning account. Then, system will calculate gain or loss subtracting Base Amount from Converted amount: 405,718.70 – 438,935.49 = – 33,216.79. This amount (- 33,216.79) will be shown as loss in Exchange Rate Gain/Loss account. And, if NBD EUR bank account has balance for the previous period (Dec 31, 2015). This amount will be converted to base currency with rate at the end date of previous reporting period. It will be Dec 31, 2015 in our case. And, if the converted amount is different from the amount in base currency, gain or loss will be recorded to Retained Earning account. 15,962.32 – this is loss amount reflected in Retained Earnings.